Nathaniel T Butterfield started representing Phoenix Insurance Company in 1815. Nathaniel T Butterfield was a merchant with an eye for a good thing who gradually became involved with banking and insurance and founded Bermuda's oldest bank (N.T. 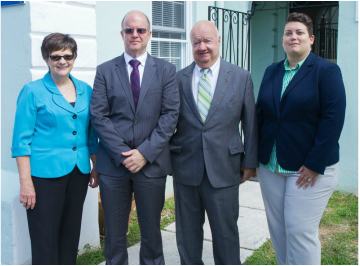 Butterfield & Son, Ltd.) and Bermuda's oldest insurance agency (C.N.A. Butterfield & Son, Ltd.). The two split apart in the early part of the twentieth century with the bank becoming a public company while the insurance agency remained a family business. There is still a client who according to family members (records are hard to come by before the twentieth century) has been covered continuously since 1815. In 1984 the Phoenix Insurance merged with the Sun Alliance and in 1997 Sun Alliance merged with the Royal to form the Royal and Sun Alliance. Due to these changes the agency has begun a relationship with Lloyds which will allow other lines of business while maintaining strong customer service and independence. ​The company has always remembered that it insures property owners rather than property. Clients are the focus and customer services is what makes us different. We will continue to explore new ways to help people to sleep soundly on windy nights, travel with more peace of mind, face business challenges from a secure foundation and take on what risks we can to make life better for our customers.